I graduated from the Art Therapy/Counseling program at Southwestern College in 2005. My career thus far has been primarily focused on advocating for women and their families affected by substance use disorders. My interest in working with women can be traced to early childhood experiences with gender inequality and through the influence of my parents who were both leaders in helping professions. My mother received a Presidential Award and was featured in a documentary about her “daring” approach to education working with “at risk” children. She believed that every child had a right to excellence in education and that education equaled freedom from poverty, trauma, disease, and neglect. My father, with a desire to be a physician, worked his way up to administrator at a Catholic hospital. He instilled in me a curiosity about life, disease, science and medicine. My mother lit in me passion for social justice and advocacy. Both taught me how to care for people and find fulfillment in hard work. My undergraduate studies in fine arts were focused on gender and the psyche and upon completion of my graduate studies in art therapy I fully intended to work in hospice but instead, was led in a different direction into the field of addiction. My first job out of graduate school was as an art activities coordinator and chemical dependency counselor at a residential treatment facility for adolescent boys. The highlight of my work with them was a showing of their work at a local community center. The show was entitled “En Querida Memoria” which translates to “In Loving Memory.” The boys I worked with were forced to grow up quickly in the drug-filled border regions of Texas. 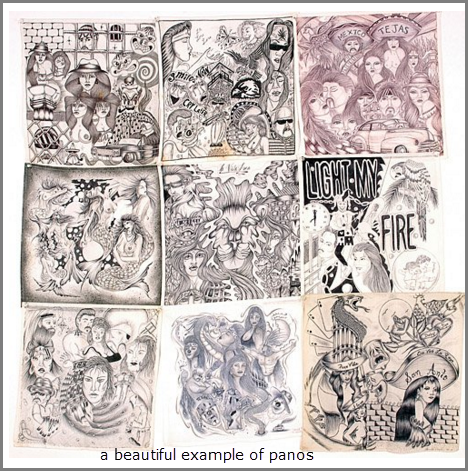 Their access to art form mainly consisted of panos sent to them from incarcerated fathers and uncles. They created panos that expressed their losses, as if their tears into the handkerchief painted a picture of their grief as it related to their drug use. Some of them received scholarships from local colleges as a result and have continued on to have healthy lives and successful careers in art. I quickly learned that my own experiences of trauma, substance use, and mental health disorders helped me reach a depth of compassion with my clients that Dr. Gabor Mate refers to as “recognition,” which is essential for working with this population. After working with both youth and adults in the field of addiction treatment, I was promoted to Director of a substance use disorder intervention program for pregnant and parenting women that took me out of the confines of the counselor’s office and into clients’ homes, neighborhoods, clinics, community centers, etc. This opened my eyes to the unique experience of women with substance use and mental health disorders and the possibilities of care. My dreams came with frustration in outdated and ineffective approaches by justice systems, child welfare, primary care, and treatment. Frustration turned into passion to make systemic and policy changes, to be a part of a paradigm shift which I strive for in my current role. I am particularly interested in efforts to ensure that women with substance use disorders are given the tools, support, and opportunity to parent their children, and have access to medications, particularly in justice systems. Several years ago I learned from Dr. Ira Chasnoff that physicians and nurses caring for substance-exposed newborns used certain non-pharmacologic interventions in order to reduce symptoms of neonatal abstinence syndrome. I was shocked to learn that all resources that described these non-pharmacologic interventions to soothe newborns with NAS were either for medical staff or foster parents and much of it value-laden. This sent a message that there existed an overall assumption that birth mothers would not be involved in parenting their own children when, in fact, they were and they were often very good at it. One of my first goals as Women’s SUD Coordinator was to find a resource for birth mothers needing this information and if I couldn’t I would create one. I reached out to both Kathy Mitchell from the Birth Mother’s Network and Dr. Ira Chasnoff from the Children’s Research Triangle and they confirmed that nothing like that existed and that this type of resource was needed. I organized and led several DSHS staff, a community care team, birth mothers, a media team and production team to take part in the creation of two videos for birth mothers of substance-exposed newborns. Women with substance use disorders are keenly perceptive of any hints of bias and so I had to ensure that all parts of the team were aware of their own bias, myths had to be dispelled, and birth mothers needed to understand how to discuss their own experience without using stigmatizing language. The team became committed to making a video that was based in science, while being compassionate, highlighting strengths and addressing stigma. The project resulted in two videos accessible to all on YouTube one of which recently won a bronze Telly Award in the category of Social Responsibility. I also recently submitted an exceptional item to the Texas legislature and $11.2 million in funding was appropriated to support intervention, treatment, and integrated programs aimed at reducing incidence and severity of neonatal abstinence syndrome for which I am the project lead. I have just taken on a leadership role in my unit and was recently assigned the role of perinatal mental health coordinator. I am currently participating in the SAMHSA sponsored Women’s Addiction Services Leadership Institute which has been instrumental in supporting my leadership role. I love the work I am honored to do every day and am committed to building a workforce in Texas of behavioral healthcare providers dedicated to improving the health and well-being of Texans affected by substance use and mental health disorders. I have attached a short Bio for your convenience. Thank you for the opportunity to share my passion for my work. I am incredibly grateful for my experience at Southwestern College and the impact it had on both my professional and personal growth.